ANN ARBOR, Mich. — Children with brain cancer may soon get some help from mice with the same disease, thanks to new research from University of Michigan Medical School scientists and their colleagues. To create the new mouse model of children's brain cancer, the researchers caused a mutation that occurs in many tumors, and used special stains to distinguish on a microscopic level the healthy brain tissue (red) and the areas where the mutation took hold and a tumor arose (blue/green). In a new paper in Science Translational Medicine, the U-M team describes how they developed a novel brain tumor model in mice. The mice have the same genetic problems as those seen in many children with the most dangerous forms of brain cancer. That means the mice should be able to serve as a new test bed for treatments aimed at shrinking children’s tumors. Unlike adults with brain cancer, children cannot receive radiation therapy, so doctors must rely on medications and other strategies. Brain tumors are the leading cause of cancer death in children. A lack of treatment options keeps survival rates low. And unlike previous attempts by others, the model generated at the U-M has a fully functional immune system, which makes it even more alike the children they mimic. In addition to developing the new genetically engineered mouse model for the form of cancer called glioblastoma multiforme, the researchers made a key discovery about brain tumor biology via the mice. Their work focuses on a protein called ATRX, and its role in helping cells repair damage to DNA. 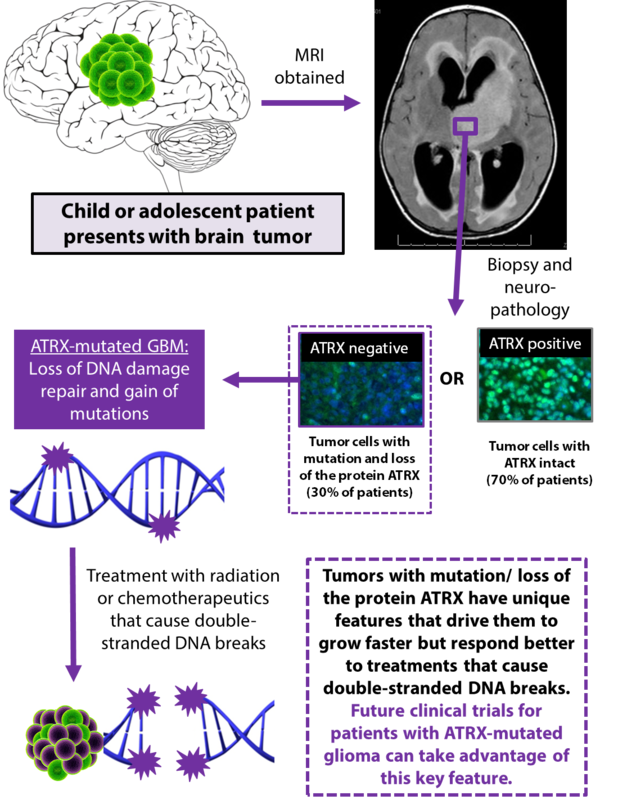 About one-third of children and young adults with brain cancer have ATRX mutations in their cancer cells. it prone to brain tumors. But in an ironic – and potentially beneficial – twist, the researchers also showed that if they treated the mice’s tumors with drugs that damage DNA, they could actually shrink tumors more effectively and improve survival.This genetic instability accelerated tumor growth and reduced the survival of mice that went without treatment. Using a special genetic technique that introduced the same mutation in mice, soon after birth, the scientists were able to generate brain tumors that made less of the ATRX protein. Then, they showed that when the cancer cells didn’t make enough ATRX, the cells couldn’t join together the two ends of a broken DNA strand. DNA-damaging cancer drugs already exist, and are used for other purposes in adults. If further research in the mice bears out, they could soon be tested in children whose brain tumors also show a decrease in ATRX production. The first author of the study, U-M children’s cancer specialist Carl Koschmann, M.D., helps guide the treatment of children with brain cancer at U-M’s C.S. Mott Children’s Hospital. He also studies brain cancer at the basic cell level in the Castro laboratory. Castro’s team at U-M, and their colleagues on teams at the Johns Hopkins School of Medicine, the University of Rochester, and the Institute of Cancer Research in London have been working toward this goal for several years. A crucial aspect of the mouse model development was the ability to use what’s called the “Sleeping Beauty” technique of inserting genes into stem cells in the brain of newborn mice. This allows their brain to develop normally, but also triggers the development of cancer by adding mutated ATRX genes and other genes known to be involved in cancer. They also looked at genetic data on several hundreds of adult and pediatric brain tumors from around the world. That helped them confirm that mutations in the gene that directs cells to make ATRX are responsible for making the tumors genetically unstable. Personalizing treatment for brain tumors based on an individual’s ATRX mutation status is still a concept, not a reality. But the researchers believe their mouse model and the close collaboration with pediatric brain cancer treatment teams at Mott Hospital will accelerate the ability to do so. Other research at U-M is developing new options for treating brain cancer through immunotherapy – harnessing the immune system to attack cancer cells once an injection of a particular gene therapy is delivered into the brain tumor. The team is also working to discover new antigens that the ATRX-deficient brain tumor cells may have. Once they find such tumor neo-antigens, as they’re called, they could design other immunotherapy strategies that could target them. They also hope to work with pharmaceutical companies to test existing or new drugs in the mice, and determine if they could work against ATRX-mutated brain tumors. “The technique could be tested in children, too, if research involving the new mouse model shows it might be successful. That’s why having a fully functioning immune system in the mice is especially crucial,” says Lowenstein, a co-author of the new study. The study was funded by the National Institute for Neurological Diseases and Stroke (NS054193, NS061107, NS082311, NS094804, NS057711, and NS074387, and by the National Cancer Institute (CA172380), as well as the St. Baldrick’s Foundation Fellowship, and an Alex’s Lemonade Stand Foundation/Northwestern Mutual Young Investigator Grant. Learn more about pediatric brain cancer treatment at the University of Michigan C.S. Mott Children's Hospital. The potential use of the new model for guiding treatment in children with brain tumors.